Colleen Jones and her Halifax team (third Kim Kelly, second Mary Sue Radford, lead/vice-skip Nancy Delahunt and coach Helen Radford) were 5-3 winners over Scotland’s Jackie Lockhart in the women’s semifinal, and will battle Switzerland’s Cristina Lestander for gold on Saturday at 10 a.m. (all times MT). Bryan Cochrane’s Ottawa squad (vice-skip Ian MacAulay, second Doug Johnston, lead Ken Sullivan, alternate Howard Rajala and coach Bill Tschirhart), meanwhile, prevailed 5-2 over Ireland’s Peter Wilson in the men’s semifinal on Friday night, following up on an 8-1 triumph over Wales’s Adrian Meikle on Friday morning in the quarter-final. In the women’s semi, it was a battle of former world women’s champions, with Jones coming out on top against Lockhart, whom Jones had never defeated in three past encounters at the world women’s championship. But in Friday, Jones didn’t need to throw her final stone. 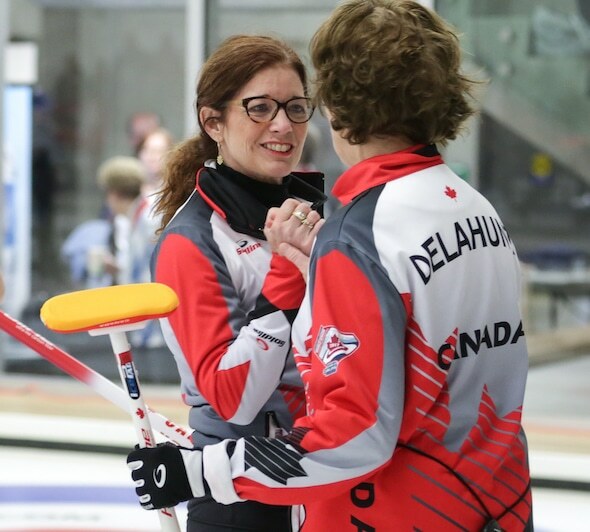 The Canadians had two rocks buried in the four-foot, and when Lockhart, the defending world senior women’s champ, was heavy with her last-rock draw, the Canadian team was able to celebrate its victory. 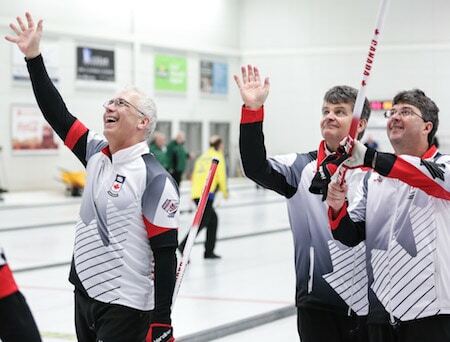 Canada, a perfect 7-0 in round-robin play, opened the game with singles in the first two ends, and was up 3-1 after five before the Scots came back to tie it with two in the sixth. But Jones was able to engineer a blanked seventh end to have the hammer coming home. 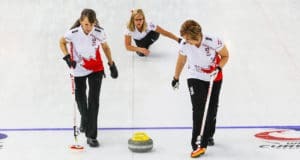 Now, she’ll attempt to win a leading 11th gold medal for Canada in the 16-year history of the World Seniors when she takes on the Swiss, who beat Patti Lank’s U.S. team 8-5 in an extra end in the other semifinal. The U.S. will play Scotland for bronze on Saturday morning. The Canadian men, meanwhile, were in a tight game with the Irish, who were reluctant to mix it up. Canada took two in the first, gave one back in the third, and then took single points in the fourth, fifth and sixth ends to put the game out of reach. After a perfect 6-0 round-robin run, Cochrane said his team was eager to get started in the playoffs, and it showed on the ice. 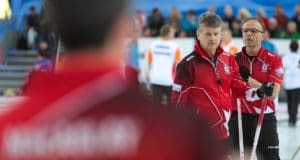 Canada will take on defending world senior men’s champ Mats Wranå of Sweden in Saturday’s 2 p.m. gold-medal game after the Swedes knocked off Uwe Saile of Germany 7-3 in the other semifinal. Wranå defeated Canada’s Randy Neufeld in last year’s gold-medal game on home-ice in Karlstad, Sweden. 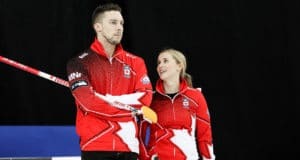 Meanwhile, the World Mixed Doubles Championship playoffs continue on Friday with Canada’s Joanne Courtney of Edmonton and Winnipeg’s Reid Carruthers playing Latvia’s Santa Blumberga and Andris Bremanis in the 7:30 p.m. quarter-finals. A win for Canada will guarantee a spot in the 2018 Winter Olympics mixed doubles draw.